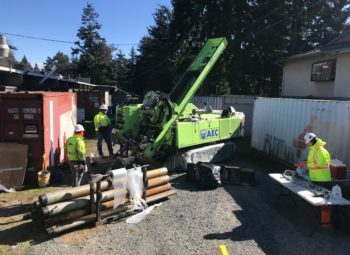 After breaking ground in August 2018, AEC Drilling has become a powerhouse in the Pacific Northwest drilling industry. Performing jobs in central Oregon, near the Washington-Canadian border, and into the Idaho panhandle. AEC Drilling is not only able to work independently, but harmonizes with our other teams on cleanup actions requiring strict monitoring. We have happily seen this decrease overall project cost for our clients and increase the efficiency of project completion. Our drilling capabilities include auger, direct push, and sonic methods, as well as a vac truck to maintain our commitment to lessen environmental impacts. Please see below for detailed information about our services, and to schedule our team for your next project. Auger rigs use a hollowed auger which is extremely efficient at drilling a sample of mineral deposits, to test physical properties of sub-surface materials, and to install fabrications such as monitoring wells, remediation wells, and geotechnical instrumentation. This method is primarily used with soft materials or weak solids, and when used in these conditions auger drilling is one of the quickest and most cost-effective methods available. Our Geoprobe 3230 also combos as a direct-push, adding more efficiency and saving cost if we’re unsure which method may be better for the site. 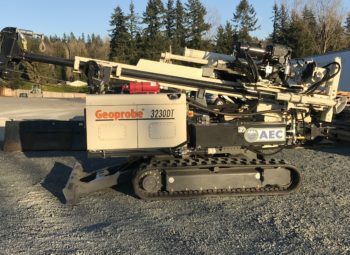 The Geoprobe 7822 is AEC Drilling’s rig of choice when working with projects requiring finite sampling. A direct-push rig works by driving a small-diameter rod and/or tools into to-be-drilled material(s) using a hydraulics or percussion. The benefit of using this particular rig is their compact size which creates a smaller project footprint, allows them to reach places larger equipment cannot, allows for easier use by operators, and makes them more mobile to increase productivity. This method also produces no cuttings in the drilling process. Direct-push drilling is a standard for soil, soil gas, and groundwater sampling, soil remediation, geotechnical sampling testing, and more. AEC Drilling, in turn, will be able to offer all of these services. The Terra Sonic 150 Compact Crawler is our marquee rig when working on projects utilizing the highly sought after sonic drilling method. Sonic drilling is a technique that utilizes liquefaction, effects of inertia, and temporary soil porosity reduction to help mitigate friction on a drill. It is able to do this via an oscillator housed in the drill head which generates a high-frequency, resonant energy that combines with the rotational movement to evenly distribute the force exerted back onto the drill from newly fluidized particles. AEC proudly offers this service due to its waste reduction and overall efficiency. The process of sonic drilling significantly decreases slough which significantly increases the integrity of gathered samples. The sonic method has also been proven to be faster and more cost-effective than traditional drilling methods. 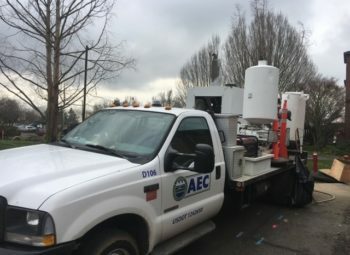 AEC’s Vacmaster System 3000 is mounted on a Ford F550, allowing for small site footprint and maximum maneuverability. This system is fully equipped with jackhammer and concrete corer, can reach up to 10 feet in depth, has a 300 gallon spoils tank with hydraulic lift, and uses air as its primary source of operation. 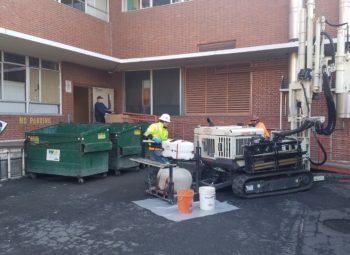 Having a vac truck on site allows for our Drilling Services to safely search out underground utility lines and cleanup any potentially impactful materials being pulled up from drilling procedures. Schedule A Drill Rig Today!